PC's Blog: Help finishing NEFERET'S CURSE! AMAZING ! IVE NEVER HEARD OF AN AUTHOR USING A "TREDDESK"! THAT'S IS SUPER UNIQUE& UNHEARD OF:) HUGE FAN! How can you write and walk on a "treddessk"?? But of course, a Goddess writer can multitask right? Your puppy is cute! Did you adopt him? In France Pitt bull dogs unfortunately suffer from a bad reputation: in the SPCA I volunteer to there are some of them, suffering from men's foolishness..
Glad "Neferet's Curse" is on its way: it must be very interesting to write about "the very bad guy"! Best wishes, and say Hi to little Cammy! Oooh, NEFERET´S CURSE. The history I´m waiting for. I read the sneak speak of Neferet and the grandma Redbird. So crazy. I ready the sneak peak with Neferet and grandma Redbird, omg when I read that I pictured Redbird with do some Cherokee spirit thing on Neferet making her fly or something...can't wait!!! Hi Guys! I forget that Treddesks are unusual! I've been using one for years. LOVE IT and hate to write without it. Not only is it healthy - with hours of walking versus hours of sitting, but I've also found that it makes me more productive. Think about it - how often do you solve a problem or come up with a new idea while you're moving around doing something like putting away the dishes? It's been my experience that moving stimulates creativity. Oh, and YES, Geraldine! In the US Pit Bulls suffer from man's foolishness as well. I discovered how loving and willing to please the breed is because Kristin rescued two of them - and I fell in love with both. I still adore my Scottie dogs (Cammy and Chloe), but when my significant other and I started talking about getting a puppy, we decided to mix it up and get a Pit. One turned into two, so now we have the Scotties, Cammy and Chloe, and the two Pits, King Kong and Khaleesi! I LOVE House of Night series, but now I wanna ask you for your ohter books. I like "Young Adult Parthalon Books". Do you wrtie next book for this series? I'm very interesting what about Elphame,Brighid and Cu. Kasia - I have CIARA'S DESTINY outlined, but not written yet. I hope to do that in the next year or so. I love those Partholon books! I'm hoping to have movie updates for when I go on tour! My publisher runs the HoN site. I'll let them know there's a problem. PC do you love cats too? That's one thing I totally loved about HoN, was their love for cats since I am a huge cat lover! Aw, I'm so sorry :/ I've had a cat that died before and it's awful. I hope another cat picks you soon :) I'm currently trying to sway a cat my way. PC, you TOTALLY got me interested in treaddesks! It's a shame they're upward of 2 grand... I'll never have that much money in my life! Hayden - the tread part isn't that expensive. 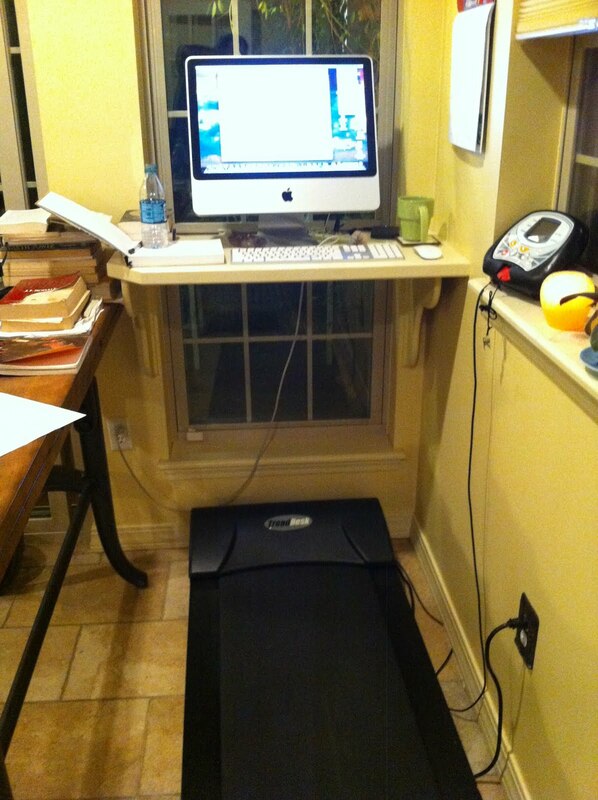 It's the standing desk that can get pricey. As you can see by the pic, I have the tread under a ledge, and not under a desk. A carpenter built it in my garden room for about $100. That's Hidden all pre ordered!! is the live chat thing on goodreads? and if so do i need an account to watch?? There should be info on the Goodreads site about the live event. I assume you'd at least need a sign in account (I have one). When are the open calls for the movie? It would be amazing if fans could audition! What a great idea! I wish they would incorporate that at my job!! Treddesk..FABULOUS! So cute! I remember one time while I was having a hard time thinking of an idea for one of my own books and I was playing with my cat Kiara and she made me think of a amazing idea! The joys of animals. Don't say a word but can give amazing advice, I think. Movie news on the tour would brilliant PC! Too bad none of your signings are in TN. OH YEAH! I saw Kristin's photo for NOH8 she looked beautiful. Make sure to tell her that for me. AMBER TERRY FOR THE PART OF STEVIE RAE! http://www.facebook.com/pages/Amber-Terry-for-Stevie-Rae-Johnson/272240656143285 Please like, share, and support my page fans! And check out my videos at youtube.come/littlesignorax. When will you be going on tour? Will dates&locations be posted soon? Tenemane - tour info is posted on my website (pccast.net). I'll post reminders here as we get closer. There won't be a US tour this time. Just an event in Tulsa and a Goodreads on line event. It's France and Germany's turn! ERTM - there will be a total of three HoN novellas and twelve HoN books. Yes, there will be movies. That info is in the movie blog archive. I have no idea if they'll use any of the novella settings/plots in the movies. Hi Pc! I can´t wait until the day of the release of Hidden. Still you´re going to write the whole book about Kalona? Do you think you'll decide to write a novella about Kalona and Nyx? I think it'd be interesting to have one about Kalona before he fell to Earth. Hi Ger and Cristina - I'm still very much interested in telling Kalona's story of his Fall from the Otherworld, but I think I need more than a novella length format in which to tell it, so I've semi-plotted out a full length, stand alone fantasy novel about him and Nyx and Erebus. Ooooh! That's extremely exciting that you're writing a novel about Kalona and Nyx! Kalona always was my favourite character! (Apart from Stevie Rae, I love Stevie Rae)I can't wait for Neferet's Curse! I've always wondered what happened to her to make her the way she is. and thanks so much for not letting Travis die in the preview!! I would've cried so hard! That sounds amazing. To have a whole new section of back story for Kalona, Nyx, and Erebus I have been SUPER curious about it all!!! Hi Vicky - I love the look of the cover model, too, but I have no idea of her name. Sorry!